The confirmed death toll in the massive earthquake and tidal waves that slammed Indian Ocean shorelines at the weekend climbed to more than 118,000 today. 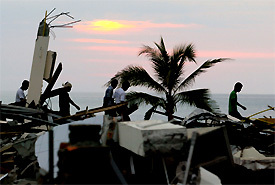 Local volunteer rescue workers walk home as the sun sets over the wrecked resort town of Khao Lak, near the Thai island of Phuket on Thursday. President George W. Bush announced on Wednesday that the USA, India, Australia and Japan would form a coalition to organise humanitarian relief for Asian nations ravaged by Sunday’s tsunami, and senior United Nations officials stressed the need to set a 12-month deadline to install an early warning system to prevent a repeat disaster. Preventing the outbreak of diseases across tsunami-hit Asia is a race against time, but contrary to popular belief, the thousands of rotting corpses do not pose the main threat, health officials said today. UN relief teams assisting victims of the deadly tsunamis have together sought 130 million dollars from international donors to meet requests for immediate relief. Britain’s Queen Elizabeth II has made a “substantial” donation to aid efforts for victims of the tsunami disaster in Asia, royal officials said. Prime Minister Shaukat Aziz and the Leader of the Opposition in the National Assembly, Maulana Fazlur Rahman, on Wednesday failed to resolve differences over the issue of President Pervez Musharraf's uniform. Princess Sayako, the 35-year-old only daughter of Japan's emperor and empress, has become engaged to a commoner and will marry late next year, the nation's top courtier said today. Indonesia has borne the brunt of Sunday's catastrophe, with a Health Ministry official putting the country's toll at 79,940 with entire coastal villages disappearing under the wall of water. In Sri Lanka 24,743 were confirmed killed by the tidal waves, while 4,916 persons were still missing, the President's office said. The death toll in India hit 10,850, with many thousands still missing, officials said. In southern Thailand nearly 2,400 persons, among them over 700 foreign tourists, were killed, the Interior Ministry said. The ministry listed 6,130 persons missing, most of whom Prime Minister Thaksin Shinawatra said were feared dead. In Myanmar at least 90 persons were killed, according to the UN, but the real toll was expected to be higher. At least 75 persons were killed and another 42 were confirmed missing in the tourist paradise of the Maldives, President Maumoon Abdul Gayoom said. Sixty-six persons were dead in Malaysia, most of them in Penang, the police said. Looking to forestall future tragedies, Sálvano Briceño, director of the International Strategy for Disaster Reduction, a U.N. initiative for increasing knowledge sharing in areas of risk management, called for immediate work to install a tsunami early warning system in the Indian Ocean such as already exists in the Pacific Ocean. Such a system would allow quick evacuation of threatened areas before a tsunami struck. Jan Egeland, undersecretary-general for humanitarian affairs and emergency relief for the UN, said the issue would be discussed at next month’s World Conference on Disaster Reduction in Kobe, Japan. Requests for international and US assistance have been made by the governments of Indonesia, Malaysia, Maldives, Somalia, Sri Lanka, and Thailand. So far, the US contribution is 13 percent of the $270 million in international aid that has been pledged, the United Nations said on Wednesday. Compared to the $35 million pledged by the USA, Spain has pledged $68 million, Japan $30 million, Britain $29 million, Australia $27.6 million, Germany $27 million, France $20.5 million and Denmark $15.5 million, the United Nations reported. The Washington Post reported the current US aid to Asia is drastically lower than in other recent natural disasters. After Hurricane Mitch in 1998, when about 9,000 people were killed and three million were left homeless in Central America, the USA provided $988 million in relief assistance. Frederick M. Burkle, Jr., at the Center for International Emergency, Disaster and Refugee Studies at Johns Hopkins University Medical Institutions in Kailua, Hawaii, told the Tribune all this would be expected after such a disaster, however, it must be confirmed from on the ground assessments. “We wait for results of assessments otherwise it’s a waste. Unfortunately, often times we produce a secondary disaster by sending too much of the wrong things too soon,” he said. Sewage-contaminated water is the main risk factor in the spread of deadly diseases like cholera, malaria and dengue fever and aid organisations are scrambling to get clean drinking water to the affected areas. ‘’There is no risk of epidemics because of dead bodies,’’ said Mr Harsaran Pandey, World Health Organisation (WHO) regional spokeswoman in New Delhi. Most agents carrying diseases did not survive long in the human body after death and the source of acute infections was more likely to be tsunami survivors who may already be carrying diseases, the WHO said. The giant walls of water which crashed ashore on Sunday destroyed safe water supplies for hundreds of villages and polluted what was left with sewage. It was this contaminated water which posed the greatest threat, the WHO said. The international health organisation has said the tsunami death toll, now at more than 87,000, could double if epidemics broke out in the affected countries. ‘’I could say many, many, many people could die if we are not able to reach people in a timely manner with safe water for the prevention of death from water-borne diseases,’’ said Mr Pandey. ‘’Diseases are spread by contaminated water, drinking water and water used to clean food,’’ she said. The first symptom of contaminated water consumption is diarrhoea and doctors in Sri Lanka and elsewhere are already reporting cases of diarrhoea and vomiting. 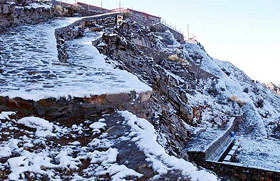 ‘’If a person gets dehydrated from diarrhoea then that is when it gets serious and a person can die,’’ Mr Pandey said. The WHO and other international aid bodies are shipping tonnes of water purification tablets to Indonesia, Sri Lanka and the Maldives, while foreign navies are sending ships with desalination units to produce drinking water. The two leaders held a one-to-one meeting at the Prime Minister's House and discussed the overall political situation, but neither of them offered any concession to help defuse the government-opposition stand-off over President Musharraf's retaining the army office beyond December 31. During the meeting, Maulana Fazl reiterated the Opposition's viewpoint with regard to the MMA-government agreement on the issue. He also demanded inclusion of the religion column in the machine-readable passports. After their meeting, both leaders appeared before a group of journalists and said that the talks were held in a cordial atmosphere and hoped that the process would continue. While Prime Minister Aziz stressed the need for congenial atmosphere for strengthening the democratic process, Maulana Fazl demanded implementation of the MMA-government agreement which required the President to shed his uniform before December 31. Maulana Fazl turned down the Prime Minister's offer to consider MMA's reservations about the National Security Council if it softened its stand on the uniform issue. He told Mr Aziz that the two issues were separate and could not be mixed. Later talking to Dawn, Maulana Fazl said the meeting would neither affect MMA's plan to observe black day on the uniform issue on January 31, nor the opposition's planned agitation. He said he would start consulting other leaders of the MMA, including Qazi Hussain Ahmed, to convene a meeting of the alliance's supreme council to brief it on his talks with the Prime Minister. When asked about the outcome of the talks, the Prime Minister said: "It is a continuous process which will be continued." He said the meeting was necessary to create an atmosphere of understanding. He said Maulana Fazl had expressed reservations over certain issues which he had promised to look into. The Prime Minister said an environment of understanding which was necessary for the successful progress of democracy had been created as a result of his meeting with the MMA leader. The princess, known informally as Nori, will leave the imperial family on her marriage to Yoshiki Kuroda (39) who works in the urban planning department at Tokyo city hall. Nori is the first princess to marry outside of the royal family since 1960 and any children she has will be ineligible to ascend the throne. 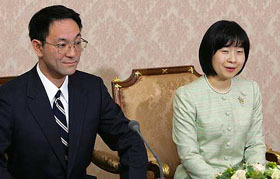 "It is encouraging that the young couple have decided to spend their life together after almost two years of friendship," Emperor Akihito and Empress Michiko said in a statement, top courtier Toshio Yuasa told a news conference to formally announce the engagement. A broadly smiling Kuroda bowed to reporters as he left his home in the morning and headed to the palace in central Tokyo. Female members of the royal family who leave it on marriage are entitled to a lump sum of up to $ 2.94 million and media reports say that judging from precedent the princess could receive around half that amount.